Kate Davidson leads this 25 mile mixed ride. 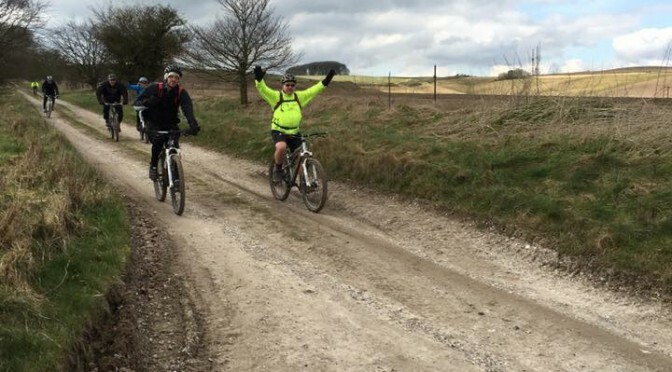 Starting at Barbury Castle, the ride will head along the Ridgeway to East Kennett and over to Alton Barnes, up Goldenball Hill and along the Pewsey Downs, and on towards West Woods. 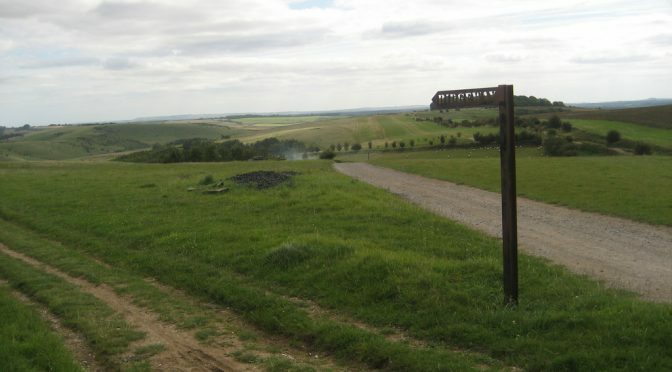 The return will be via Clatford Down, through Rockley and back up Four Mile Clump to Barbury. We’ll be riding on byways, hills, downland, woods and the odd country road. Though not listed as novice-friendly, anyone happy to ride this distance, who can cope with hills and varied terrain, is welcome. There is no planned café stop, but there is an option of riding down for a cuppa in Avebury before heading East Kennett-wards. 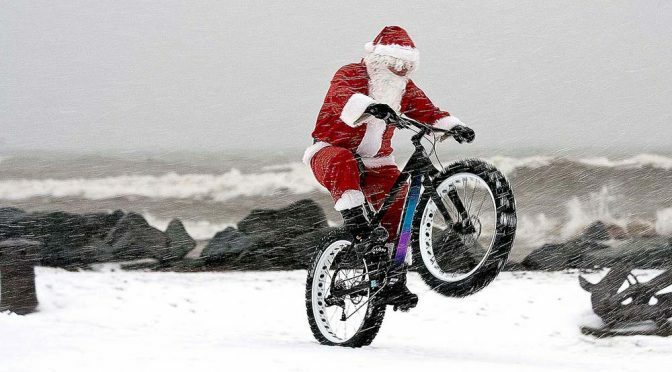 In any case, the usual applies – bring anything you might need for your bike, warm clothing and waterproofs in case of rain and a bit of food to keep you going. Kate Davidson leads this novice-friendly ladies’ ride. 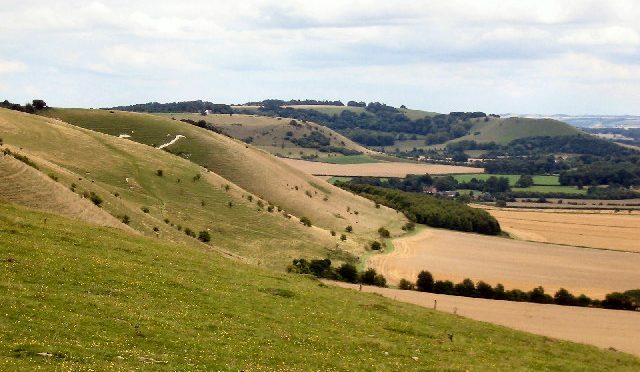 Starting at Barbury Castle car park, we’ll make our way onto the Ridgeway and head down the lovely grassy run of Smeathe’s Ridge into Ogbourne St George, where we’ll cross the road and head up from the Ridgeway towards the Swindon to Marlborough cycle path. 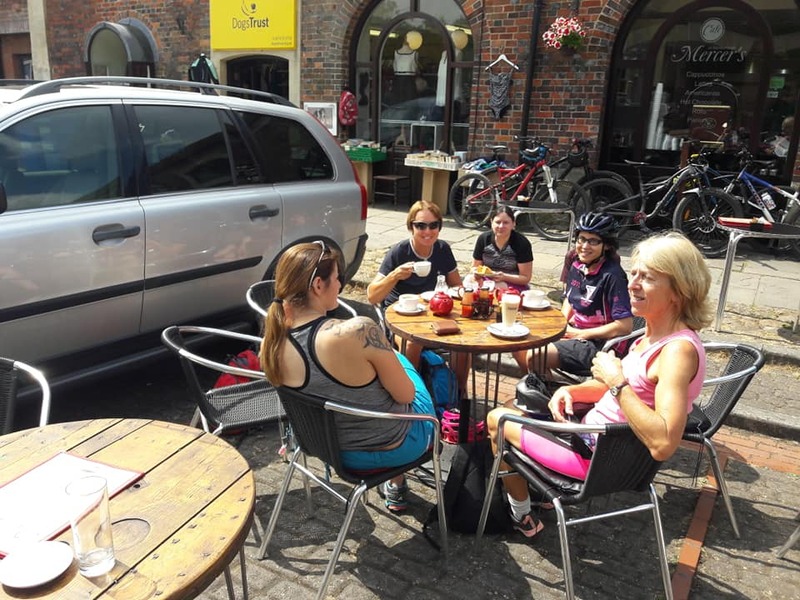 From there, we’ll ride into Marlborough, stopping for a cuppa and cake, then we’ll head along Marborough High Street up to the common, turning off shortly after onto Manton Down towards Rockley. Heading down through the woods into Rockley, where there is a mild downhill trail through the woods, which can be ridden at your own pace. There is a café stop halfway around, but bring anything you feel you may need such as water, snacks, weatherproof coat, spare tubes etc. Meet at Barbury Castle Car Park ready for a 10am start. Driving along the A419 through heavy rain, I wasn’t hopeful of anyone being at Barbury; However Debbie and Sue were already there ready to go. At this point it was just drizzle but by 10am, the heavy rain I had driven through had reached us. 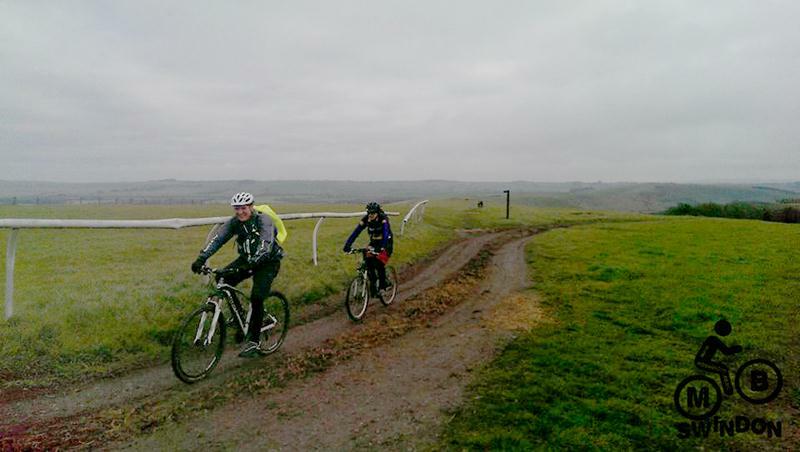 We cycled across Barbury Castle and soon realised it was going to be pretty muddy out (completely different to 6 days before when I had recced the ride). By the time we had reached the old railway line, the rain had eased and by about 10.30 it had stopped completely. We headed up the radio mast climb, stopping at 11 to observe the 2 minutes silence. It was quite poignant as the guns from the local shoots stopped as well and the sound of bird song filled the air. We carried on along the old Ridgeway, where it soon became apparent that Sue would be puddle depth scout, and then back down towards the old railway line where we stopped for snacks. 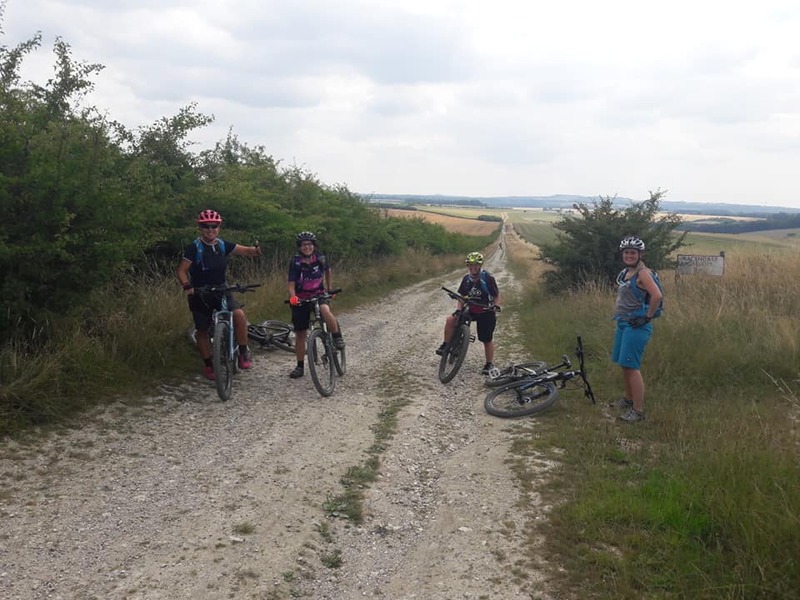 Then it was the final climbs back up to Barbury through mud, long grass and puddles (although there were some puddles even Sue wouldn’t cycle through) and to homemade cakes from Debbie. 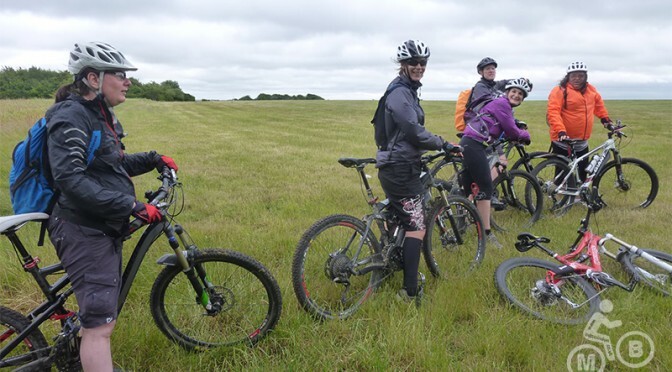 Despite the horrible weather at the start of the ride, and the fact we were all plastered in mud at the end, it was a really enjoyable ride out. Sarah Bailey will lead this novice friendly, ride which sets off from Barbury Castle (try to arrive by 9.45 for a 10.00am start). The ride will take in a range of surfaces, including natural trails (which will be muddy if it’s wet), very small amount of road, and one very short section of trail with roots, gullies and large stones. There will be about 950 ft of climbing in total, with one notable climb (or push!). There is no cafe stop planned on this route so please bring food and drink to take with you . The nature of this ride means a mountain bike with proper mountain bike tyres is needed . This is not suitable for a hybrid bike. Phil Allum will be leading this Spring ride around North Wiltshire, taking in as much of our glorious countryside as possible. We will be heading towards Aldbourne and using bridleways and byways that we very seldom use. This is a great area for biking and the views around are awesome. As we will be local, we’ll start at the earlier time of 9am from Barbury Castle (Meet at 8.45). This is a good old fashioned cross country ride; there will be roots and ruts and everything else you expect to find out in the countryside. This is a longer than usual ride, so please make sure you are happy to do the distance and your bike is up to the challenge. Note that over the 50km route, we’ll climb around 1000m! Please bring at least a spare tube and anything else you feel you may need – water and food will be essential! We are trying to plan a stop at a shop but this is unconfirmed at this time. This will be updated closer to the date. Over the last few years, the club has run regular midweek rides over the winter, known as the Urban Round. Last year, we managed to keep the Wednesday night routine going throughout the year, moving from tarmac loops of the town to off-road Ridgeway rides. We’re hoping to do the same again this year, starting with Tom Scott’s loop of the Marlborough Downs area. The ride will be restricted to 2 hours as the gate is locked at 9pm. 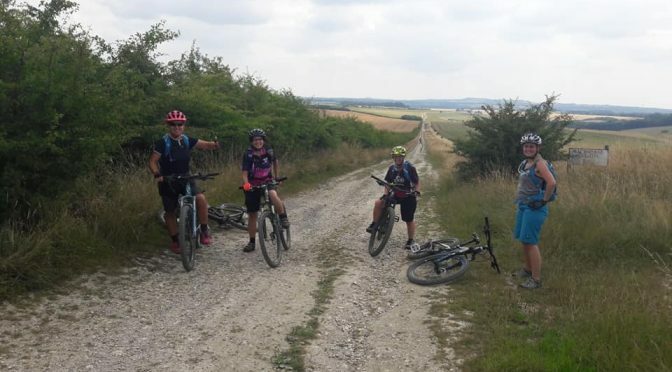 Tom Scott will lead this novice-friendly ride along some of the classic MTB routes around Barbury Castle. The route will be 12 -15 miles, depending on the conditions. There will be some climbing involved, but no one will be left behind. There are no planned cafe stops, so be sure to pack a drink and a snack.